Moving house is never fun, even if it’s only for a few months while the cottage gets a long-overdue extension and insulation fit out. I know it will be worth it in the end but sometimes it’s hard to see that when surrounded by boxes and a Little Missy determined to unpack as quickly as you pack them! It’s a time for simple, uncomplicated recipes that use up ingredients already in the fridge, freezer or storecupboard. Dishes that can be prepared in advance and let to bubble slowly in the oven or slow cooker are also a big plus. While LM might be quiet while you’re doing the prep, who knows what box she’s gotten into in the meanwhile! Between emptying rooms and filling boxes, falling down stairs and first brews, this Bean and Sausage Hotpot was the perfect comfort food dinner. Like any recipe involving sausages, the better the sausage, the better the result. Some of my favourites are the sausages produced by Jack McCarthy (the ones with apple are particularly good in this), Crowe Farm or Hick’s. I also add black pudding which breaks down over the cooking time and disintergrates deliciously into the gravy. 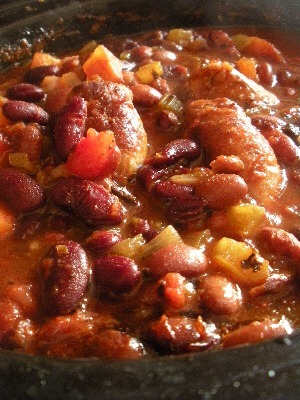 You can use whatever beans you prefer and they don’t have to be canned – I like a mixture of pinto and kidney, simply because that’s what I had taking up room in the freezer. The dish, of course, can be cooked in a regular oven. Simply bring the whole lot to the boil in an oven-proof casserole, land into an oven preheated to 180°C, and allow to cook for 25-30 minutes. Heat a little olive oil in a deep frying pan and fry the sausages over a medium heat until browned all over. Remove and cut the sausages into thirds. Transfer into slow cooker. In the same pan – pour off excess fat if necessary – cook the chopped onion, celery, carrot and black pudding until softened, approximately 6-8 minutes. Add the chilli flakes, bay leaves, smoked paprika, thyme and tomato puree to the pan, heat gently then scrape into the slow cooker with the tinned chopped tomatoes, sugar and beans. Add approximately 400-500mls water, without drowning the rest of the ingredients. Cover and cook on low for 6-8 hours. Season to taste. Serve with lemony couscous, plain buttered rice, over pasta, with garlic bread or just on top of some hot buttered toast. Grate over some mature cheddar cheese for extra comfort. do you think this will work with chickpeas? You could certainly try it although, I have to say, I prefer chorizo with chickpeas. Check out this Chickpea and Chorizo recipe for some more ideas.